Before getting into the timing of the storm that will bring a White Christmas to part of the country, I want to point out a danger: Freezing rain. 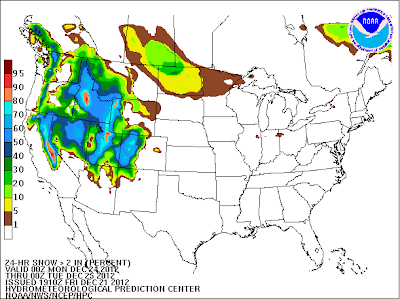 Below is the NWS's probability of 0.01" or more of freezing rain (glaze ice) accumulating from 6pm Sunday to 6pm Monday (Christmas Eve). This stretches along I-70 from St. Louis to Indianapolis. The probability in the dark red area is 95%. There is a similar area around Haggerstown, MD, also on I-70. 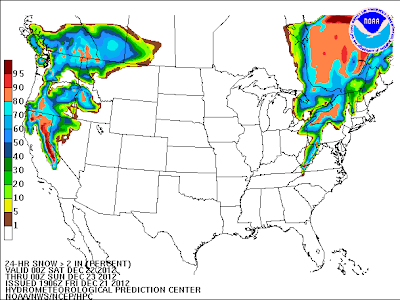 I hasten to add that this does not look like a major ice storm with power failures. But, freezing rain is the worst condition for driving. I'll continue to monitor this threat over the weekend. 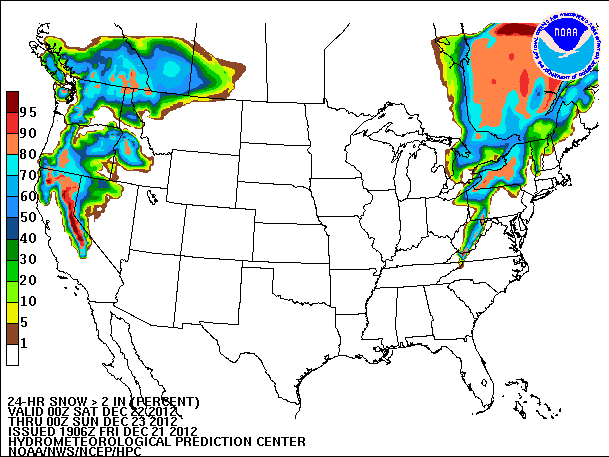 Here are the probabilities of two inches or more of snow accumulation from 6pm Friday to 6pm Saturday. Getting across the Sierra on I-80 is going to be a real problem. For Christmas itself, that is still a difficult call. Here is my best shot. 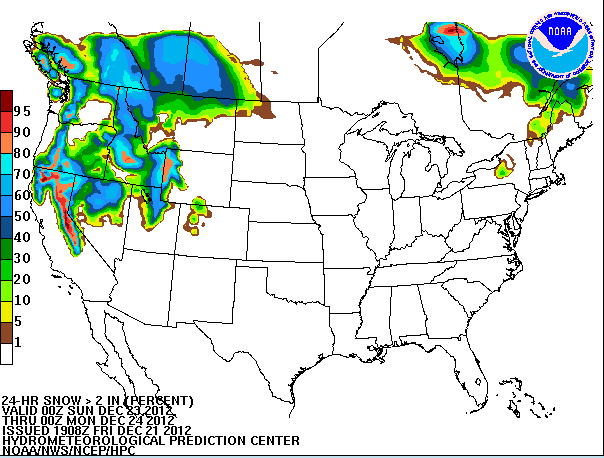 This is the snow accumulation forecast valid for December 25 from the U.S. GFS model. The yellow areas are amounts of 6-8 inches. However, the GFS has, on average, a slight southward bias in these situations. I would probably scoot this forecast to the north roughly 20-50 miles. I would like to recommend you check back over the weekend if you are traveling the first of the week. I still do not entirely trust the models in this particular situation. Temperatures over the central U.S. will be at or below normal from Christmas Day to at least New Year's in most locations. There will be a second storm around the 28th-29th give or take a day depending on location. 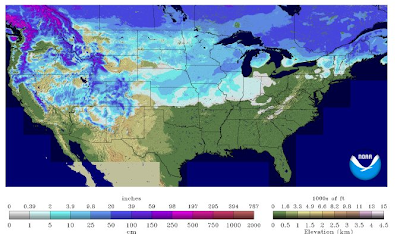 AccuWeather has special coverage for the Northeast's snow potential. Since our sister office is headquartered in State College, PA, I'll link to them for the coverage of that region.